I’ve had a very productive evening this evening making these cute little notebooks that I designed around the humble post it note block. I picked up my little sticky noteblocks in Asda for £1 for a pack of 12, combine with papers and bits from my cardmaking stash and I now have what I think is a very respectable set of books which would make lovely little last minutes gifts. 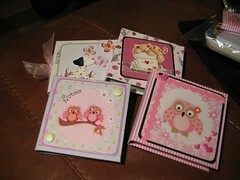 And who doesn’t like a lovely notebook? I made 6 in total this evening and gave two away to friends complete with the instructions on how to make them. I plan to make some more for a friends charity event to sell on her stall. Click the picture to go to more notebook loveliness.